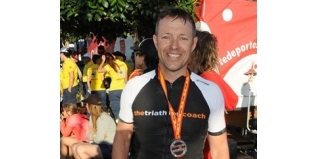 After falling well short of his goal at Ironman Lanzarote in May, coach Simon Ward has Ironman Wales lined up next. This time around he has different goals, and wants to end the season with a solid marathon run. Thoughts of 'Hawaii 50' may well become 'Hawaii 50+1', and here Simon looks at what training he's done, versus what he thinks is likely to be needed in the future to improve his performances to the levels required. Here we go again. Ironman Wales in just under three weeks for round two of Hawaii 50. This time I have eyes wide open. What do I mean by that? Surely as a coach I'd have been fully aware of everything prior to the last race? Maybe not! I've seen it many times as a coach. An athlete thinks that just because they really, really want it and they can put in a winter of hard training, then that qualification spot is going to fall into their lap. Sorry, but its not quite that easy. Sure, there will be a few “talented” individuals who will be able to achieve this quite quickly but most athletes, including myself, are in what I call tier 2 - have the potential but require lots of hard work and a little luck. If you have read my previous blogs you will know that I'm trying to qualify for Hawaii in my 50th year. Despite a good winter of training and being where I wanted to be, I think that even in the weeks before the event I knew it wasn't going to be enough. I wasn't quite there on the bike and I was a long way short on the run and so it proved on race day. I don't think that my time was a fair reflection of my fitness or ability, but that was my performance, so it sticks. Why do I think I'm still short of the mark? I've been doing a lot of reading about Training Stress Scores (TSS) and Acute and Chronic training load. (ATL & CTL). I've also compared my scores with those that I coach who have qualified for Kona. What I managed this year was all I could manage without getting ill or injured, but it's not enough. My daily TSS is about 110 and it needs to be nearer 130-140. My CTL is around 80-90 and it needs to be nearer 110-120. To hit these figures I probably have to up my training load to around 20 hours per week during build weeks. This can't happen overnight but with a patient approach and the right external factors (low stress, good sleep, clean eating), it can be done. I'm now quite comfortable with my current training load of 14-15 hours per week. I can get solid results and still have a life. Getting up to 20 hours will be tough. Adding five hours per week is the easy bit. After all, its just 3% of the total weekly hours available. But, it means finding five hours from somewhere else for the additional recovery needed. Sustaining it for many months/years and the living around that volume will be the hard part. Anyway, how I do that is for a future blog. Getting a Kona slot these days means finishing in the top 1-2% of the race. At Ironman Wales there are 50 places for Hawaii 2015, which means about three places in the 50-54 age group. As its one of the first qualifiers for next year, there is only a slim chance that there will be any roll downs, so a podium place is what it will take. To qualify in Wales I'll need to finish in around 10:45. Have I improved that much in four months? Probably not. I reckon 11.30 is more realistic but I'm not aiming for that. In fact I'm not going to look at the watch for the entire race. I will be racing with power for the first time so that will guide my effort on the bike but I only have one main goal for this event; to run a marathon that reflects a solid physical and a huge mental effort. That's it. I have to finish the season knowing that I have it within me to get close to a run time capable of getting that place. I know its a mental battle, but somehow I have to find a way to crack the code. I already have Austria inked in for 2015 and shortly I'll be entering Ironman Mallorca. This is “plan B”. Assuming I manage to finish all of these races I will be at number 12, which means I can enter the Ironman Legacy lottery. I think after all of that loyalty (not to mention £000's in entry fees and travel), I'd take a spot if it came my way.